It seems that for the CLE236 listeners in western North America, my worst fears came true. 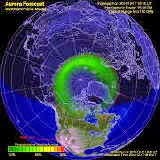 The week preceding last weekend's listening event had seen great MF propagation and quiet geomagnetic conditions. 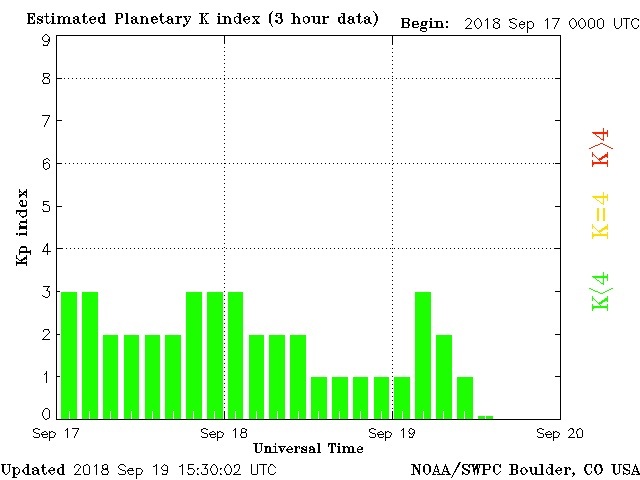 On Friday evening, shortly after the start, a geomagnetic storm commenced, with K-levels reaching 5-7 at various stations ... pretty much sounding the death knell once again. 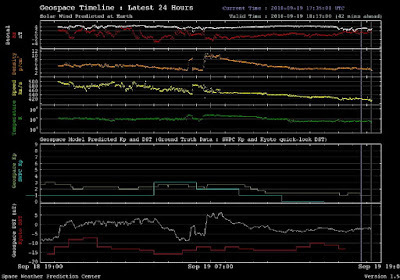 It seems more than coincidental that almost every CLE in the past few years has seen horrific geomagnetic conditions in lock-step with our scheduled monthly events! Since there were no active regions on the Sun at the time, I suspect, as mentioned in my last blog, that we were victimized by a sudden spurt from the same coronal hole that whacked us last month, as it lined-up once again on its monthly reappearance. Arriving on Friday evening as sunset approached, the effects seemed to spare the rest of North America (and Europe), as western listeners were the only ones reporting poor propagation. As well, lightning noise, often abating by this time of the year, created havoc for many listeners ... even those with good propagation. I can only hope that next month's event will see a major improvement in noise levels as well as in propagation quality. 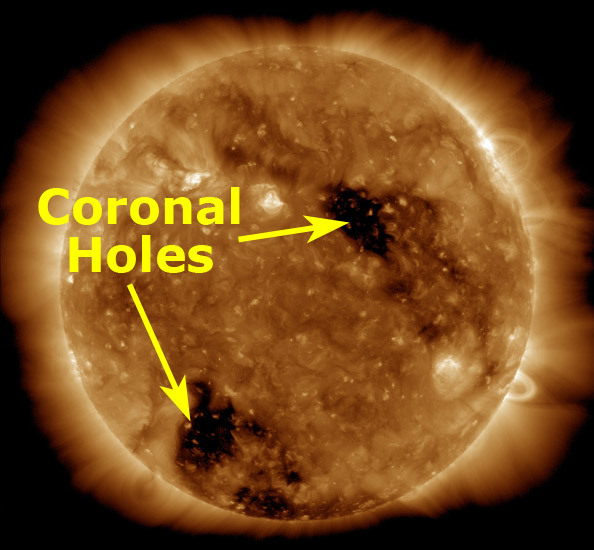 Hopefully, that pesky coronal hole will have closed itself by then! On top of the above mentioned challenges, CLE236's frequency range was smack on top of my local pest, AP-378, whose antenna is less than one mile from my own antennas. Having an S9 +60db signal in the middle of the narrow CLE range does make for challenging listening. My 10' x 20' loop knocked AP's signal down about 25db, allowing me to hear the following signals, some only barely. How time flies. Once again it's a CLE weekend. It seems like the last one was just a week ago! 'CLE's are 'Co-ordinated Listening Events, and NDB DXers around the world focus their listening time on one small slice of the NDB spectrum. This time the hunting ground is the 15 kHz slice from 370.0 - 384.9 kHz. This is a somewhat dreaded range for me since my local blowtorch NDB, 'AP' (378 kHz), sits right in the middle of the range. 'AP' is located at the entrance to Active Pass, the main ferry route to Vancouver Island, and the antenna is about 3/4 of a mile down the beach from me. Needless to say, the beacon is about 40db over S9! With careful loop nulling, I can reduce this by about 25db but it's still an enormous signal to deal with. Hopefully you can put 'AP' in your own log this weekend but its 25-watt signal will be much weaker for you. It's been logged as far east as Illinois and with your receiver in the CW mode, can be found on 378.399 kHz. All too often our CLE weekends get hammered by geomagnetic disturbances, possibly because our monthly schedule syncs up nicely with the Sun's rotation and the disturbance from the previous month once again rotates into position. Conditions this time surely can't be much worse than for our previous event and today's mid-week check looks promising. 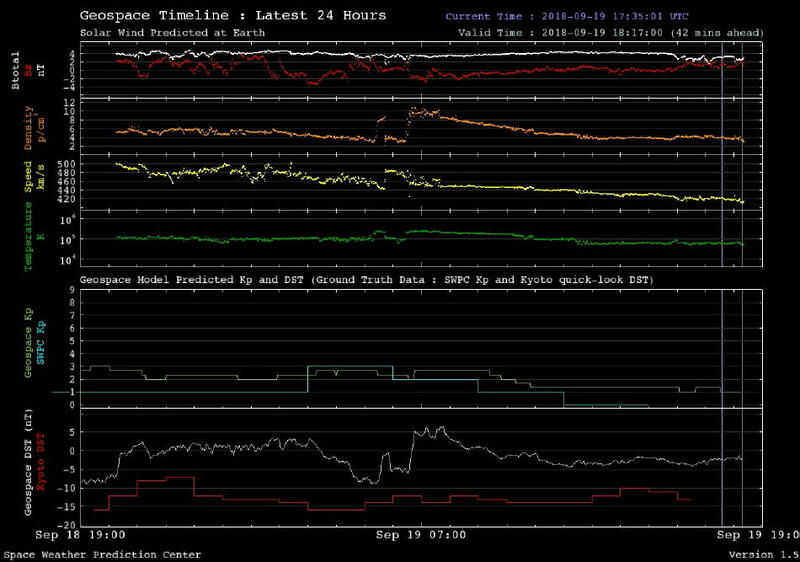 Things seem geomagnetically quiet at the moment so lets hope they stay that way. LF and MF propagation can often be amazing in the fall and as summer storms start to dissipate, the band can become much less noisy. this Friday and celebrates the arrival of the Equinox this weekend. (not in an attachment) with CLE236 and FINAL at the start of its title. UTC on Tuesday - you can then check that your log has been found OK.
results within a day or two. This fall's running of the CW "Classic Exchange" will take place on Sunday, September 23 and on Tuesday, September 25. The following week will see the Phone "Classic Exchange", on Sunday, September 30 and on Tuesday, October 2. 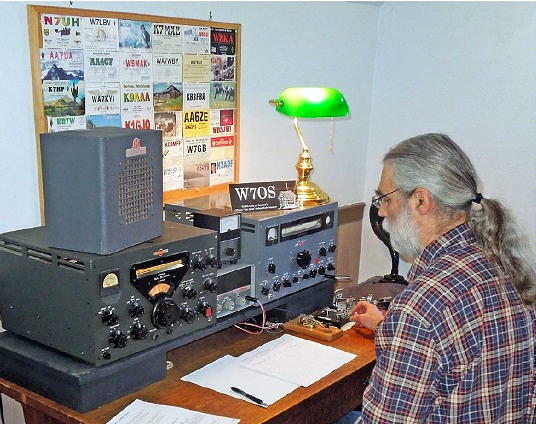 The "CX" encourages participants to use older vintage gear including any homebrew equipment, both receivers and transmitters. A unique scoring system provides bonus points for various equipment and combinations as well as encouraging 'repeat contacts' when you switch to different equipment. No vintage gear? ... no problem! All amateurs are invited to participate and get in on the fun no matter what they are using and submit their scores. The CX is a low-key relaxing affair and the 'extra' Tuesday operating period should encourage a lot of midweek activity from the vast numbers of retired operators who cherish and run older gear. For complete details, see the web site announcement here. If you've never entered the Classic Exchange, why not give it a try this year as it truly is a case of 'the more the merrier' ... and eastern operators, make sure to keep the porch light on for us out west! In the years before amateurs in the UK and Ireland had access to the 630m band as we know it today (472-479kHz), hams there could apply for a 'special research permit' allowing them to operate between 501 and 504kHz. One of the first and most active stations was operated by Finbar O'Connor, EIØCF, located in the most northern part of Ireland, near Malin Head. 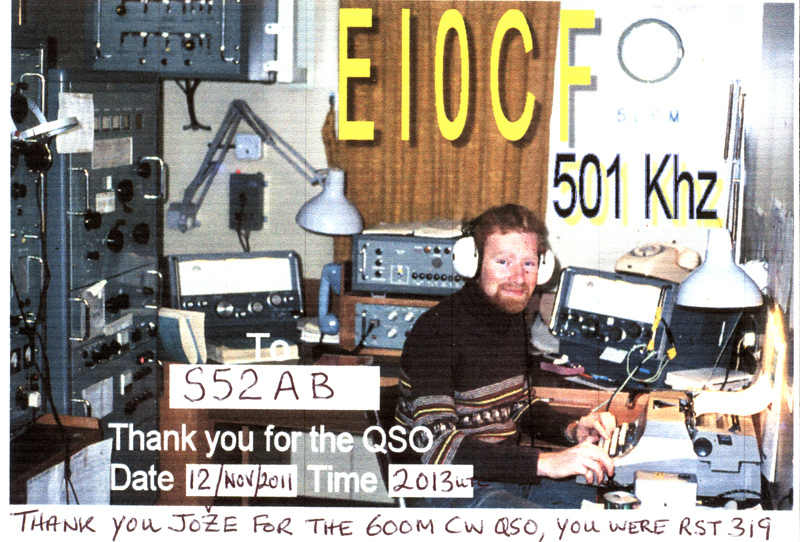 In the early days, Finbar might as well have been AC4YN in Lhasa, Tibet, as a 630m or a 2200m QSO with EIØCF was a much prized DX trophy and a genuine 'right of passage' for many little backyard LF and MF stations throughout Europe. Nowadays, 630m activity in Europe is not as robust as it once was but Finbar is still active on MF from his modest station. He reports being copied in North America on several occasions. Although mainly active in the WSPR mode, Finbar is now considering the two-way JT9 weak signal QSO mode and may hopefully once again, tease east coast North American MF operators with a new rare entity from his seaside location. Over the years, EIØCF has gone portable as well as marine mobile to demonstrate the viability of this part of the spectrum for very reliable groundwave comms using equipment that is both simple and quick to deploy. Although he used a CW-based system, his conclusions could just as easily apply to SSB or digital modes. What follows is a delightful adventure, in Finbar's own words, describing some of his field trips back in the 500kHz experimental days ... perhaps it will inspire some North American portable work or provide ideas for an emergency prep 630m grab-and-go kit, or just get you excited about our newest amateur allocation. Operations on the north flank of Slieve Snacht Inishowen Peninsula. 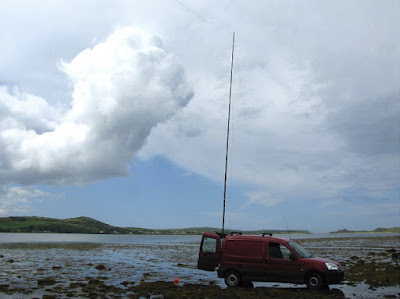 In June 2009 Ireland joined a growing number of countries permitted to operate on a small portion of the medium wave band, just below the commercial broadcast segment, in the range 501 - 504 khz. Several stations were granted permission and operations commenced. As has been documented elsewhere many stations have been worked, both in band and cross band, at home and abroad, ranging from Continental Europe, across the Atlantic to the USA and Canada, down to the southern end of Ukraine and finally up to Iceland, Norway, Sweden, Finland and also being heard in Moscow. A notable feature of this band is the steady reliable nature of groundwave coverage and with this in mind I recently availed of the facility whereby portable operations can take place. Comreg, together with the IRTS and the individual involved, require that each event is applied for, giving relevant dates, location, contact details, hours of operation and the power of the transmitter being used. 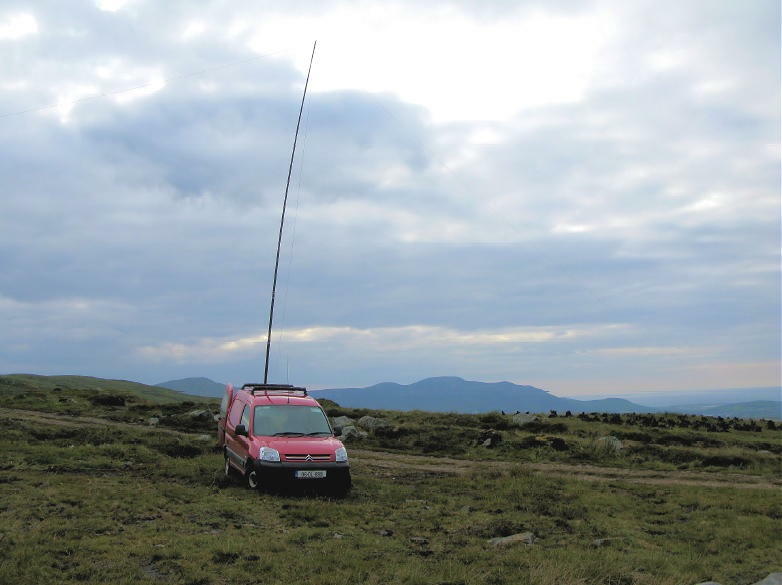 In the period leading up to all this it was necessary to build and test a viable portable station based on the use of my Berlingo van. A 30' part of a 40' Spiderbeam fibreglass pole was used with a simple round wooden peg to secure the 'Tee' wire antenna, which was fabricated from twin twisted multistrand speaker wire. The vertical used both, while the rest was pulled apart to form the two horizontal legs. A 100 metre roll of 1.5 mm insulated earthing wire was cut into 16 lengths to provide radial wires, with lugs soldered to one end and a bonding bolt used to secure a single point for the radial kit. The far ends formed a small loop which was sealed and secured with insulating tape. The loop provided an eye for a small L shaped stiff wire, fashioned from discarded coat hangers, an ideal and cheap way to hold the ends of the radial wires in place in the ground. Using this superb idea, I got the welder out and made one for myself. It worked perfectly. I now had the support and wire antenna, with a ballpark figure for what might resonate, along with the radial kit. I next needed a dedicated antenna tuning unit. An old variometer and two extra fixed multitap coils were selected. A home made 1 amp ammeter and SWR twin meter unit completed the fit-out. These were all assembled on a base with a handle on the top, making it easy to move around whilst out and about. The main antenna for 500kHz was disconnected and left floating and the van set up with all this gear, but no transmitter. Instead, my little antenna bridge running off a 9-volt battery provided the necessary signal to start testing for basic resonance. Whether from sheer good luck or some sub-conscious input, resonance fell within the range of the variometer with only one of the two extra coils in circuit. The relative height and length also play a part in the range of resonance secured. Matching to 50 ohms was then optimized by selecting 4700 pf Mica capacitors using Croc Clip links. The available value ranged from 1 nF to 14 nF. 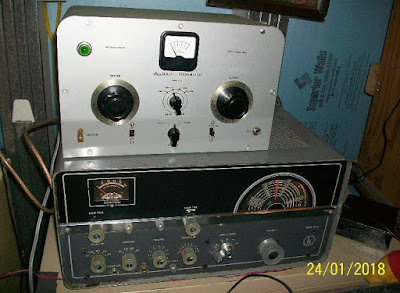 I have a selection of 500khz transmitters, two of which are to the design of Roger, GW3UEP, who lives 10 miles inland from the coast, in south Wales. 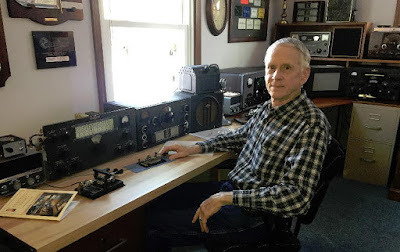 His 500khz web site is well worth checking out, containing plans for versions of his 500khz transmitters, test equipment pictures and recordings of 500khz activities. One of these was used to put some RF into this first portable style installation, and by arrangement, Roger listened and heard my signal. 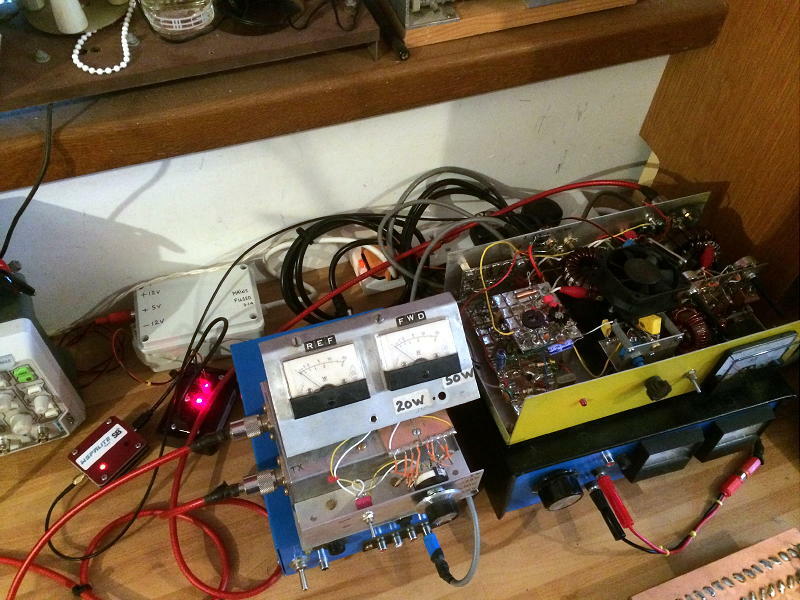 We delightedly completed a short contact, with my transmitter running just 10 watts.Things were looking good. One of the very valuable things about portable operations stems from the need to bring together several elements to secure a working radio station, without the usual backup we enjoy from home. Planning is essential. Doing a dry run, i.e. 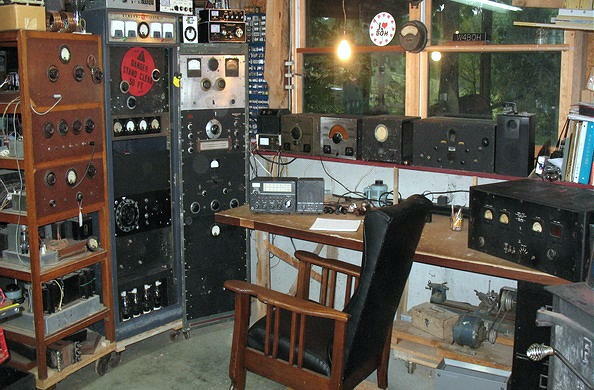 actually physically building the intended station then notating all the gear required and making a list as well as providing backup items, particularly those that which if broken or lost, would render the whole radio station non-viable. This also extends to the operator of the equipment. Will they be warm or cool enough, have shade, food, water and enough needed rest? Always be prepared to abandon the project if safety is compromised, for whatever reason. 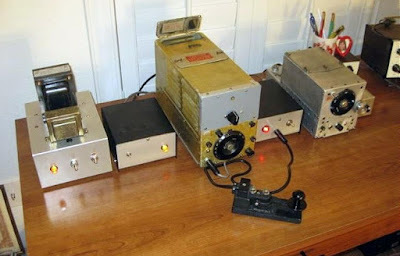 Now that I had a viable portable station for 500kHz working, it was time to head off and test both the equipment and myself in the real world, but without any live transmissions taking place. Several sites were chosen and tested, with particular emphasis placed on remoteness, i.e. high up on mountains or near the sea. All sites worked very well, but those by the sea proved really excellent. Reception of NDB’s (Non Directional Beacons) provided a ready supply of medium to low frequency signals for range testing. 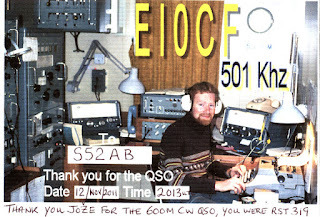 I was now itching to “ have a go “ out in the wilds, on 500kHz! Using the method required by Comreg, an application was made for several sites, on specific days. 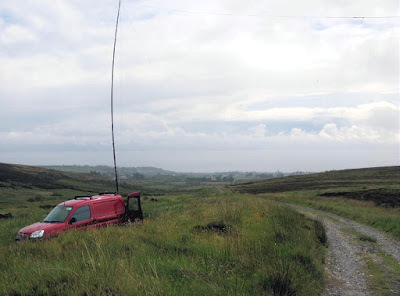 In early June I loaded up the van with all the gear and headed off for the mountain above Redcastle, County Donegal. Using a narrow track and climbing higher, to about 270 meters, a place was found leading to an old quarry. Typically, it had started to rain. By the time I had erected the support pole, pulled out and secured the top hat wires using light nylon line and deployed the radial wires around and below the vertical drop wire, my trouser ends were very wet! Plugging in the 12-volt supply, the receiver was very quickly perked up, using the variometer. The Morse key connected to the QTX transmitter and the transmit / receiver switch flicked over. Time to get some RF flowing in the antenna. Sure enough, on key down, the antenna current meter shot right up to 400 mA, but the SWR match was not exactly perfect. Time to work those Croc Clips and start selecting shunt capacitors to find the perfect match. Soon I had that sorted to my satisfaction, with antenna current now up to 550 mA. A quick return to receive showed that Roger, GW3UEP was already tuned up on frequency. "..... GW3UEP DE EIØCF/P HW K"
He came back straight away! Oh joy, we were on the air on 500, in a remote mountain area, the top of my antenna almost tipping the clouds as they swept past. I was open to the elements, standing at the back door of the van with the tips of my fingers reaching for the knob of my very favourite old Amplidan morse key, snug beside the other bits and pieces of equipment on the van floor! My logbook, with its pages flapping back and forward in the wind, soon had the first 500kHz portable contact documented. A full hour later, solid steady signals continued at a distance of 250 miles. Proving just how good groundwave signals can be, I terminated communications from the remote portable location, happy with the results. Within 12 minutes I had dismantled the station and was on my way to Moville, along with a strong cup of coffee at the café on the town's main street. Several other portable operations have since taken place. A number have also occurred at my home location. We live right beside the sea; high tides lap up on to the salt marsh, which is part of the property. Driving a single earth rod into the sea shore to a depth of 1 metre, with no radials and just a single wire between the rod and the ATU earth, the 1 amp RF meter had its meter needle slamming against the end stop. Lots of antenna current for 15 watts transmitter output power. Those same 15 watts only providing, at best, 550 mA, whilst up on the mountain sites. 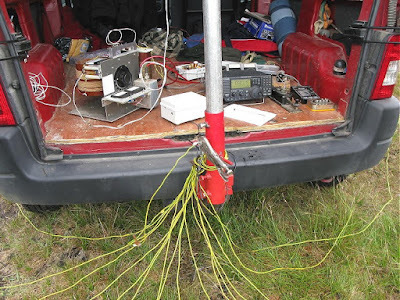 Finally, it was thought productive to try a kite-supported antenna from the seashore portable set up. Winds on the day selected seemed strong enough to enable my Delta shape kite to head aloft with a flying line and antenna wire attached. 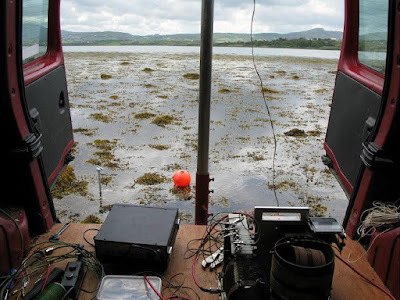 The Berlingo van was driven down on shore, everything connected and tuned up. All was well, or was it? The receiver now seemed quite dead with no band noise and no antenna current on transmit. Looking skywards I could see nothing. My eye followed the antenna wire heading for deeper water. Then I saw it. The kite had plunged into the sea! The following 30 minutes entailed untangling loads of seaweed with the line wrapped around rocks, barnacles and everything imaginable. What a mess! I almost gave up, but knew that Roger would be coming up on frequency, on sked, in about 15 minutes. Eventually I managed to get the kite skywards again but by now the wind was acting more unpredictably. I established contact with Roger and he immediately gave me an S 7 report for my 15 watts. This equated to the report I would get from my main station antenna running 100 watts. My single ground rod and 150 feet of wire were doing the business. We carried on our contact, but what remained became a battle of wits, with a kite constantly diving down and soaring up again. 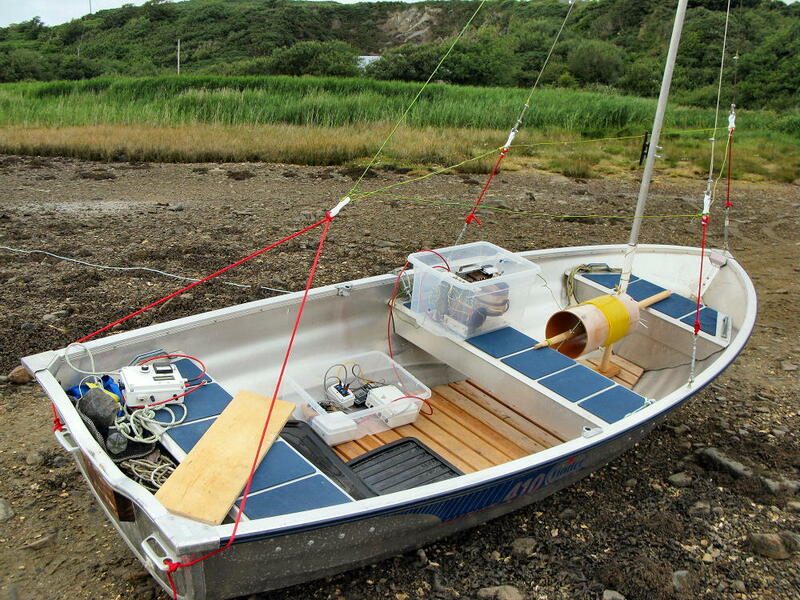 Several times the antenna wire was in part lying on the sea shore and antenna current way down to 200 mA or lower. My left hand was on the variometer tuning knob, tweaking the setting as best as possible, while pulling in the slack to keep the antenna wire off the ground. Feeding the wire out again to a misbehaving kite, I kept keying away with my right hand, keeping Roger updated so he could understand why my signal was changing both in pitch (sudden antenna mis-match conditions) and signal strength. Luckily he was also making a recording, which proved later to be a fascinating record of a difficult portable antenna and station operation. It’s remarkable how tolerant, despite the wildly changing antenna conditions, the system actually was in practice. Communications were maintained despite all these negative factors and severely decreased radiated power at times. 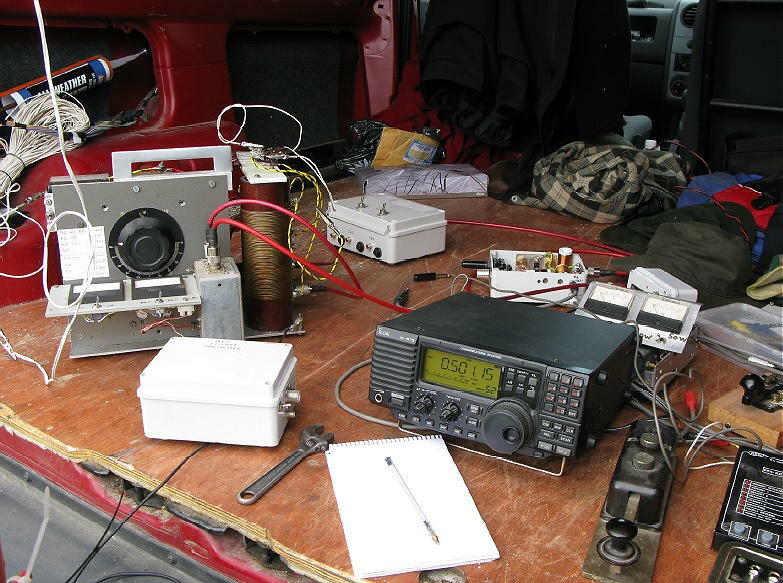 Several other tests were conducted within these experiments which would have been almost impossible to conduct without the challenges thrown up by my portable operations. To my mind the 501 – 504khz band exhibits a distinct advantage for enhanced groundwave coverage over that available to higher frequencies. Relatively simple equipment deployed in remote locations, with or without the availability of the power grid, would provide a solid backbone link or network in times of emergency. Transmitter power output was kept deliberately low to ensure that a higher ERP would not mask any possible weakness in the system. I am happy to conclude that Medium Frequency CW proved it’s worth once again. Already I have further plans to test smaller, more compact portable antenna and earthing systems in more remote locations. Finbar O’Connor EIØCF Malin, County Donegal.